I’ve been trying to use my time more productively, so even if I’m procrastinating, I’m still doing something worthwhile. As an alternative to clicking around on social media while I’m putting off doing something, I dug into my files and found a bunch of online courses I took about a decade ago. Some of them, I actually remember taking, but I’ve changed and my career has changed, so my answers to all the homework assignments are totally different. Some I don’t even remember taking. If I really don’t want to do whatever it is that I should be doing, at least I’m reading this material and doing the exercises, which is moderately helpful. It’s also been good this week since I’ve spent much of the week waiting on a plumber. I had an appointment on Wednesday, and when the appointment window passed with no word, I called, and they thought my appointment was Thursday (I’m almost certain it was Wednesday because I took the first open slot after the holiday). Then Thursday they called and said one of their trucks broke down, so could I reschedule for Friday. Now I’m waiting yet again. I can’t really focus on writing when I’m waiting, so doing these courses is a good way to spend the time. Anyway, one of the courses was on finding and nourishing your “muses.” I’m not sure why I have these materials because I’ve never been that big into the “woo woo” side of writing. I haven’t named my muse, I don’t talk about “the girls in the basement” or anything like that, so I doubt I would have paid for this course. It must have been a bonus offering or something that came with a writing group membership. But the theme of the year is exploring, so why not? The course encouraged us to really visualize our muses — the creative part of our subconscious — and then that will allow you to figure out how to feed and care for them so they can be even more creative and you can learn to listen to their input. I’ve never really thought of my creative side other than as The Voices (as in “the voices in my head said I should do this”), but I decided that if I have muses, they’re a group kind of like the Inklings, that group at Oxford that included C.S. Lewis and J.R.R. Tolkien. I imagine a group of professors hanging out in pubs and tea rooms, chatting about fantasy by the fire over cups of tea, or else they take long rambles around the countryside, making up stories as they go. Feeding these muses would involve going to libraries and bookstores, sitting by the fire with a cup of tea, or taking long walks. 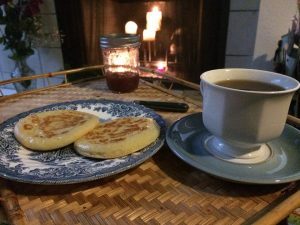 Since it was a cold, dreary day yesterday, I decided to take “feeding” literally and made crumpets and tea to have by the fireplace (my fireplace is filled with candles so I can get the warm glow without the hassle or mess). I don’t know if it sparked any creativity, but it was a fun break in the day and I still met my working time goal (the crumpets have to rise for about 45 minutes, which put a nice timer on a writing session). Now I’ll have to make time for other things my professors might enjoy. I’ve always rolled my eyes at those “I get up at four and get all my words done before the day starts” writers. I’ve also rolled my eyes at the advice to get started on writing first thing in the morning, before you do anything else. I’ve never been much of a morning person. Even when my body clock started to shift last year, I wasn’t what real morning people would consider a morning person, and getting up earlier didn’t mean I started thinking earlier. I felt like I needed time to ease into the morning. I like to read the newspaper over breakfast and tea. Reading e-mail and various social media feeds was a way to warm up my brain and get going. But I’ve been reading a number of things lately about getting started first thing in the morning with the most important thing you need to do, and I’ve seen testimonials from other writers about the difference it made to write first before doing anything else. I’ve been doing that somewhat over the last week, but I really dove in yesterday. I still eased my way into the day somewhat, since I read the newspaper and ate breakfast, then took a walk. During the walk, I brainstormed a bit about the book I’m working on, imagining scenes and thinking about my characters. When I got home, I wrote down the things I’d thought about. Then I started writing. I managed to get half my target word count done before lunch, and I still managed to read my social media feeds and post a few things. I had time before lunch to practice some of my choir music. After lunch, I shut off the wi-fi again for another good writing session, and instead of the reflexive check e-mail, check the feeds break, I did a little tidying around the house. By the end of the day, I’d written more than 6,000 words, and I still had a little free time before the end of the work day. The funny thing was, I don’t feel like I missed out on anything. I did more of what I wanted to do when I wasn’t wasting time doing mindless stuff. I don’t know how much of that has to do with writing early, but I think that helps with getting started. Starting is always the hardest part, breaking out of what I call the “doom loop” of reading the feeds, posting something, then going back to see if anyone’s responded or posted anything new. Once I’ve started, keeping going is easier, and starting before doing anything else does seem to help. So, I’m sold. I guess I have a new work schedule. It’s deadline week, So I’ll be digging in and focusing on my work. Not that it’s a do-or-die deadline. The final book is due in January. But I want to have time to revise it and also enjoy the holidays, so I’d like to finish this draft by the end of this week. I’m off to a good start. I got up early this morning and have already walked a couple of miles and written a couple of thousand words, along with planning out what I want to write today. It’s a really nice day, so I’ve been enjoying Patio Office. That started when I thought I’d have a cup of tea on the patio after my walk while I did some brainstorming, then I decided to just haul the laptop outside and work. That way, I can enjoy fall and still get my words done. While I enjoy optimizing things, I also know that it’s good to shake things up every so often. Ruts are bad for creativity. I also like to take advantage of my flexible working conditions. I don’t have to sit in an office all day. Moving around keeps things fresh. I haven’t tried writing in public, though, since I’m easily distracted. I don’t think I’d get much done in a coffee shop, though I have gone to the coffee shop by the library to brainstorm and plot. I’ve gone to parks for brainstorming and plotting, too, especially when I need to be near water. Fortunately, I live near a lot of water, so it’s easy to find a place to sit by the water and think. 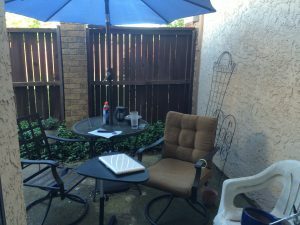 Patio Office, taking my laptop desk onto my patio, is my way of getting away from the house to write. The wi-fi extends outside, but I don’t really think about going online when I’m outside, so I’m less likely to have the impulse. I can’t see any books I want to read or housework I need to do, so my only distractions come from nature, like watching the lizards sunning themselves, the snails creeping their way up the trellis, or the flowers blooming. And sometimes the mosquitoes that need swatting. My morning glory didn’t make it this year—between caterpillars and whiteflies, it got stripped of all its leaves—but my mum is blooming for the third year in a row. It sure beats a desk in an office. I totally forgot to post yesterday. I was so excited to get started writing and pleased with myself for being ahead of schedule — and then last night I realized that I was ahead of schedule because I skipped something. Oops. But it was a really productive day. I wrote 5,000 words, planned today’s writing, and did some research reading for a future project. Unfortunately, as tends to happen in this phase of a book, that research reading collided with an idea fragment to come up with a whole new story. It’s not ready to write, but it could be fun. 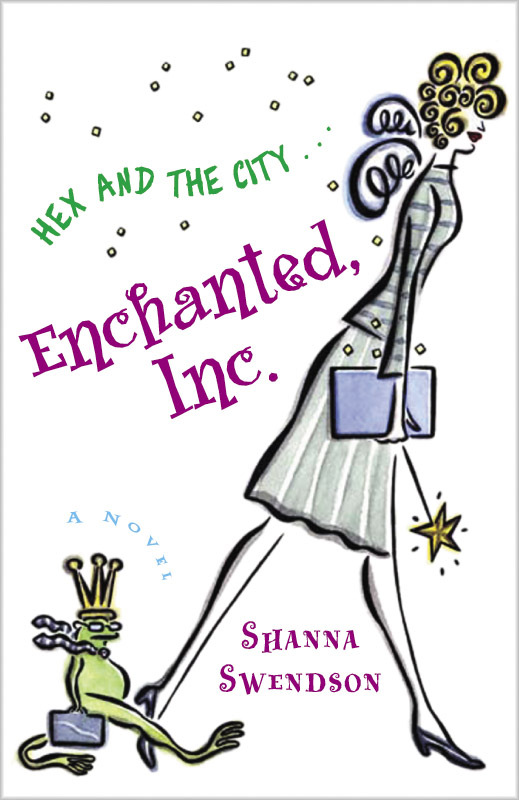 And then a conversation with my agent brought a very old (like, 20 years ago) story back to life in my head. Yep, I’m in the middle of a book. That’s when I seem to be at my most creative. Ideas are flying around, demanding attention. The trick is to write down what I know when they hit me, then I realize they’re nowhere ready to write, and I can get back to what I was doing. Until the next idea hits. I probably won’t hit 5,000 words today because I have choir tonight and need to get a lesson plan together, but it would be cool if I could manage it. I guess I still had thinking I needed to do, or else there was a big part of me that really wanted to play hooky on a glorious fall day because I had a hard time concentrating. I ended up walking to the library because something I’d requested that’s a reference for this book had come in (which counts as work, right? ), and I did some work on the patio, cleaning up after last week’s round of rain (just in time for this weekend’s round of rain). Then when I sat down to brainstorm, I had a much clearer idea of what I needed to fix. I’m still early enough in the book that I need to solidify some things. The proposal for this book was really vague, which means I need to get more specific now, and that means making some decisions about how, exactly, the magic works in this world and finding ways to hint at that in the early pages. And since I’m still in the part where the heroine doesn’t know what’s going on while various forces are acting upon her, I need to figure out what the plans of the various forces are and what they’re doing. I want to give just enough of a hint that something’s not right without making the heroine look like an idiot for not noticing it. But after yesterday’s crystal-clear blue skies and just barely warm temperatures, it’s gloomy and rainy today, which means it’s perfect for curling up to write a good book.